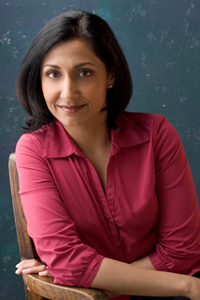 Anita Chandwaney is a performer, playwright and director. Her first full-length play, Gandhi Marg, won 2nd place in Writers Digest’s 75th Annual Stage Play Competition and was a finalist for Chicago Dramatist’s Many Voices Project. She and MEH Lewis co-wrote Thirst, which is a semi-finalist for the 2011 O’Neill Playwrights Conference and an Honored Finalist for the Collaboration Award given by the New York Coalition of Women in Arts & Media. Her short plays and monologues include, 2020, Instant Recall, Helpline, Judging Jaya, and On-Track. Anita is the recipient of a 3Arts Fellowship, Ragdale Residency, Neighborhood Arts Project grant, and serves on the Artist Advisory Council for the Ragdale Artist Retreat. Her Chicago acting credits include, Pulitzer Finalist Miss Witherspoon by Christopher Durang at Next Theatre, and work with Lookingglass, Organic, Remy Bumppo, Pegasus, Collaboraction, Stage Left, Silk Road, Strawdog, Live, Center Theatre and Rasaka – for which she was Founding Executive Director and co-producer of Jeff-winning The Masrayana. In NYC she worked with Ensemble Studio Theatre, Playwrights Horizons and Open Eye New Stagings. You can catch Anita in Enemy of the People at Stage Left, where she is an Ensemble Member. Gandhi Marg was inspired by “A Streetcar Named Desire” and is set in the neighborhood surrounding Chicagoā s Devon Avenue, affectionately known as little India. The action takes place in the front “yard” of Shardul and Shanti’s apartment building, and inside the apartment itself. It is a small one-bedroom apartment on Rosehill Street. Shanti and Shardul are newlyweds and very much in love. Shanti’s sister, Bina, arrives to discover her sister is married to her former flame. It is the expectations these first generation South Asian-Americans have of each other, and themselves, that bring the past into the present and affect the futures of everyone involved. Momma, Dolly and Minnie are indentured servants in Louisiana. Their family has worked for the Beauregards for many generations as paying off their debt continues to elude them. The play opens at the Beauregard country estate in December, 1860 – a few days before South Carolina becomes the first state to secede from the Union. Momma tries to convince her daughters that they are in an excellent position. Dolly and Minnie’s inner voices propel them to question their situation. Momma refuses to entertain the prospect of one day leaving the Beauregards “employment“. Will she continue to ignore her daughter’s urging? Will she develop a connection to her own inner voice? Or has it been ignored and silenced so often that it’s gone forever? In Secession, the daughter’s inner voices manifest as Inner Dolly and Inner Minnie. They are not shy at making their point, even if it means resorting to physical combat – armed and unarmed! Kali, a South Asian American woman comes face to face with the perils of not disclosing to her daughter Devi that she was conceived of a South Asian egg donor. Only when Devi brings home her new boyfriend and shares their joyous news does Kali learn of her daughters half-sibling. Madhu, an aging South Asian woman is convinced that Nigel, an aging British man, is important to her life. As they share their stories, Nigel is persuaded that he indeed is.